Ficus religiosa, or Bo-Tree [from the Sanskrit Bodhi: “wisdom”, “enlightened”] is a species of banyan fig native to India, Bangladesh, Nepal, Pakistan, Sri Lanka, southwest China and Indochina. It belongs to the Moraceae, the fig or mulberry family. 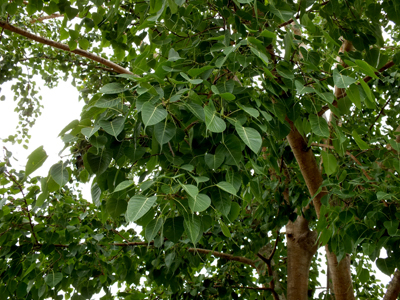 Ficus religiosa is grown by specialty tree plant nurseries for use as an ornamental tree, in gardens and parks in tropical and subtropical climates. 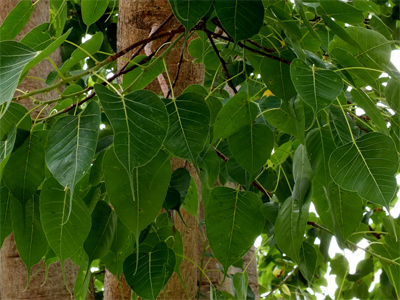 In Singapore Saplings of this tree can often be found growing on walls and roofs because birds eat the fruits and spread them around. 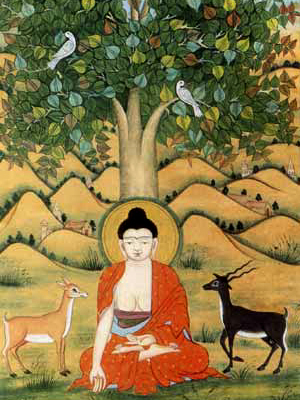 Buddhist legend tells of Gautama Buddha attained enlightenment [bodhi] while meditating underneath the Bodhi tree, a Ficus religiosa. This entry was posted in Tree and tagged Ficus, Tree. Bookmark the permalink.